Celebrities get paid to tweet about variety of products all the time, but that’s no news, is it! Celebrities get paid to do almost anything. Well, at least now they are not the only one making money with sponsored tweets. thanks to a new generation of marketers, today anyone can get paid to tweet. Paid to tweet is based on a very straight forward idea, advertisers or tweet sponsors will pay you to tweet about their products and services. But, since it will be hard and time consuming for advertisers to go look for twitter users who will tweet their messages to their followers, they use third party sites who specialize in matching advertisers and twitter users. These sites act as the middle man between you and the tweet sponsors – You sign up with them for free, and they will match you with their advertiser’s paid tweets which you can send to your followers and get paid for it. Sponsored tweets pay differently depending on what the advertiser want you to tweet about, and how important that product or service is. Also, the amount of twitter followers you have, and how responsive they are, plays a big factor in how much you can expect to make with sponsored tweets. But for most tweets you can expect to get paid anywhere from $0.10 to up to $5 or more. Perhaps the biggest and most famous get paid to tweet site, having celebrities such as Diddy and Kendra Wilkinson as tweeter and Microsoft and Volvo as advertisers. You get paid up to $5 per Tweet! TwitPub is the marketplace made for Twitter, so users can buy and sell premium tweets. Not only you get paid to tweet, you also earn money by referring your friends to Twivert. Of course, you won’t make a lot of money by tweeting, unless of course, you are a big celebrity. Nonetheless, it’s an easy way to earn some extra cash. 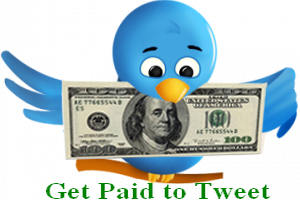 After all tweeting is not that hard, and most of us tweet a few times a day, so why not get paid for it.